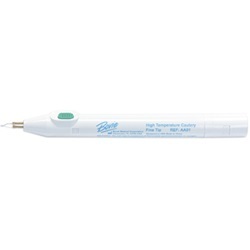 Bovie high-temperature (2,200°F) fine-tip cautery. Protective cover cap is included for storage and safe disposal. Bovie high-temperature (2,000°F) microfine-tip cautery. Protective cover cap is included for storage and safe disposal. Medi-Pak high-temperature (2,200°F) loop-tip cautery.